Masimo (NASDAQ: MASI) announced today the findings of a study recently published in Anesthesia & Analgesia in which researchers at the University of Groningen, the Netherlands, and Ghent University, Belgium, investigated the ability of Masimo ORi™ (Oxygen Reserve Index) to show trends in oxygenation in the moderate hyperoxic region (partial pressure of oxygen in arterial blood [PaO2] in the range of 100 to 200 mmHg).1 ORi is available outside the U.S. and is intended as a noninvasive, relative indicator of a patient’s oxygen reserve during moderate hyperoxia. 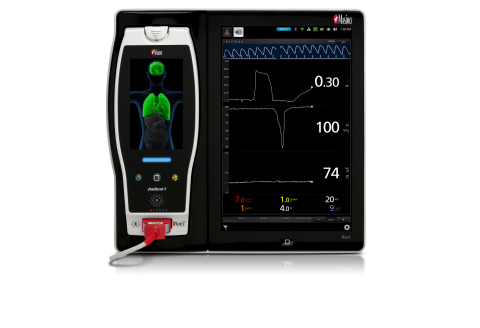 ORi can be trended and has optional alarms to notify clinicians of changes in oxygenation. Noting that monitoring oxygenation using pulse oximetry alone “gives little information on PaO2” during conditions of normoxia and hyperoxia, Dr. Jaap Jan Vos and colleagues sought to evaluate the correlation of ORi to PaO2 during moderate hyperoxia. They collected data from 20 healthy adult volunteers, who breathed a series of standardized oxygen concentrations ranging from mildly hypoxic (inspired oxygen = 14%) to extremely hyperoxic (inspired oxygen = 100%). ORi and SpO2 were noninvasively and continuously measured by sensors on both the second and fourth fingers and displayed on a Masimo Radical-7® Pulse CO-Oximeter®. At baseline and at each induced oxygenation stage, arterial blood samples were taken for blood gas analysis and PaO2 was measured invasively using a Siemens Rapidpoint 405 CO-Oximeter. The researchers collected 1,090 paired data points of simultaneous ORi and PaO2 values. In the “ORi-sensitive” range of 100-200 mmHg, the mean ORi value was 0.16, with associated oxygen saturation (SpO2) values of ≥ 97% at all points. Correlation between ORi and PaO2 was positive at all points (p < 0.0001), with R values of 0.78, 0.83, and 0.84 for sensor 1, sensor 2, and mean of both sensors, respectively. To assess ORi’s trending ability, the researchers used a 4-quadrant plot and calculated that ORi trending of PaO2 within the range of 100-200 mmHg had a concordance rate of 94%.